In Session Audio has released Fluid Harmonics, an instrument designed to create richly layered melodic patterns with ease, for Kontakt. The result is a collection of 150+ patches that combine autoplay rhythm and melody features with sound design. Audiomodern - Paths is the perfect set for use in Atmospheric Composition, Scores, Trailers, Documentaries, Advertising, World and Background music. Also usable for any production ranging from Downtempo, Atmospheric, Chillwave and Post-Dubstep to Ambient. 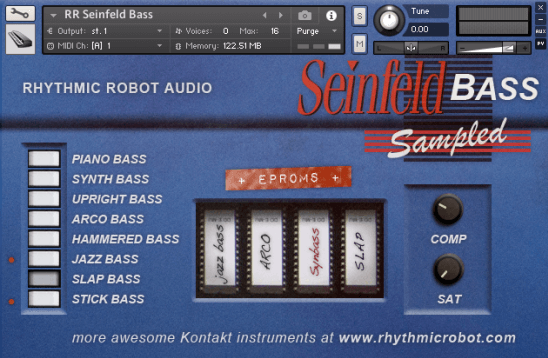 Bad Cat Samples The Indi Glock KONTAKT EXS24 is the solution to find the perfect "Glock" sound. We wanted to create something that can be in the mix naturally, without the need for too much additional processing. The library was recorded using a tape microphone, passing through a tube preamplifier and untouched AD converters. The result is a sound that fits well into any track that requires a similar sound. iCe Samples Western Banjo is a small library of banjo samples (300 MB 24-bit samples) with 6 Round Robbin repetitions, natural harmonics, string noises, release for Kontakt 4.2.2 and higher.